The Spanish Hapsburgs ruled these provinces as part of the great Spanish Empire. 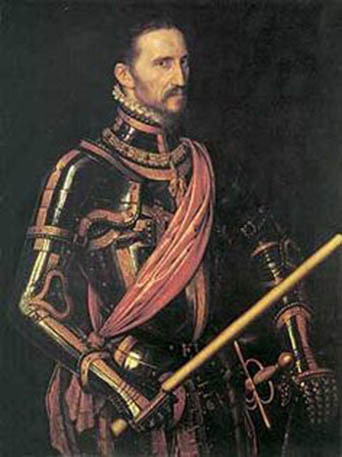 They had originally been under the influence, if not the mandate, of Burgundy but were at last united by Charles V (Carlos Quinto) who was king of Spain as well as Holy Roman Emperor (q.v.). His son, King Philip II (Felipe Segundo) governed the region through his own appointees the regents, emphasising points of taxation and above all religion. Philip was a devout Catholic,and believed in the persecution of Protestants wherever he found them. Resistance arose in the seventeen provinces against high taxes and attempts to force Protestants to convert. Serious disturbances began in the middle fifties of the sixteenth century, but the beginnings of Spanish repression almost devastated ten of the seventeen, leading to starvation and even more dissent. The rebellion against what was then the greatest empire on the planet was led by William of Orange and his mainly maritime force known as ‘The Beggars’, who established themselves in the northern provinces, principally Holland, set up as a republic in 1588, with the Orange family (q.v.) as Stadholders (q.v.). The whole terrible affair needed around eighty years to resolve, and in 1648 independence from Spain was finally recognised. Spanish people and especially Spanish literature have never forgiven the Low Countries for this long and bloodthirsty conflict, as equally the Dutch or Belgians will never forgive or forget Spanish dominance in the sixteenth and seventeenth centuries. This was established by the Spanish Duke of Alba between 1567 and 1576, and was perhaps the chief bone of contention leading to the Eighty Years War. It was a court, supervised by the soldier duke on the orders of King Philip II of Spain, to suppress heresy and opposition during the Netherlands’ War described above. Unsurprisingly, it was also known as ‘The Council of Troubles’, as indeed the eighty years war was also called ‘The War of Independence’, ‘The Revolt of the Netherlands’ and ‘The Dutch Revolt’. As must be expected, the Council of Blood’s proceedings were draconic, severe, strict and exercised with rigour. The council was comprised of seven members, but three of these were Spanish. These men took no notice of rank or privilege, which is a Good Thing, but concentrated on the suppression of Protestantism by means that caused great resentment and loathing. There can be no doubt that the council’s existence helped lengthen and intensify the Eighty Years War referred to in this post. Share the post "The Eighty years War & the Council of Blood"